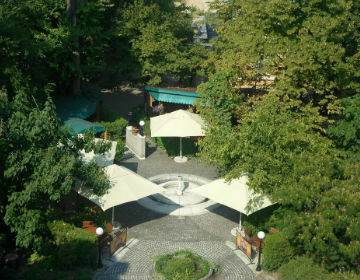 Garden and Restaurant in Lahovari Square in downtown Bucharest, managed by the Romanian Academy. The building curretnly hosting the Scientists' House - an important architectural heritage - was the property of George Assan, an important businessman which name is related to the first steam mill in Bucharest. The house was built in 1906-1914. In the backyard of the house there is a beautiful garden where the clients of the restaurant are hosted during summer. Locals in Bucharest have reviewd Scientists' House & Garden - International in Bucharest. You can find here description, reviews, address, map, phone, website of Scientists' House & Garden in Bucharest. Visit Bucharest Tips for more International in Bucharest!